With the Collomatic automatic mixer product line you can perform heavy jobs on the construction site far easier and achieve better results at the same time. These mixers very quickly prove just how economical they are, both in terms of volume output and quality. Why Collomix Automatic Mixers ? By using a Collomatic automatic mixer you achieve very short mixing times and a permanent high mixing quality at the same time. This saves your time and money on almost every construction site. Our Collomatic mixers are suitable for almost every mixing material and mixing jobs on construction site. Always on the safe side. Our automatic mixing machines can be used on construction wherever they are needed. Because of convenient handles, large wheels and a light machine weight. With the Collomix automatic mixers you can prepare large quantities of material in the shortest possible time. Up to three bags of material in one mixing process. 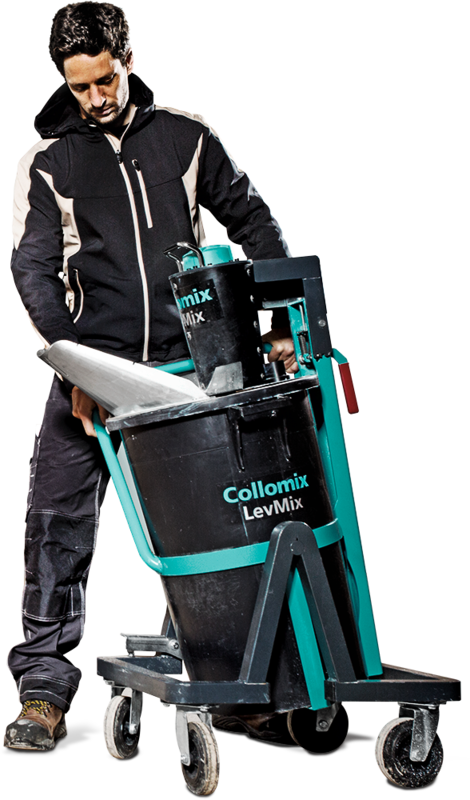 Blending of leveling compounds fast and easy with the new Collomix LevMix 65 mobile mixer. The LevMix 65 unites three steps in one operation: mixing, transporting and pouring. Save time and mix up to three bags plus of mixing material at once. Dust free operation with practical connection for the vacuum cleaner. Perfectly designed for: Floor leveling compounds and levelers, leveling fillers, leveling compounds, pouring screed, fiber-reinforced fillers, colored surfacing materials, colored coatings, liquid plastics, etc. The professional automatic portable mortar mixer for mixing up pre-bagged building materials with ease; Suitable for up to 20 gals. of mixing material; Designed for speed, mobility and reliability so it saves time, energy and money. Mixing Know-How for Automatic Mixers ! Rotating mixer AOX-S: These mixers are suitable for larger mix amounts of the most varied materials, such as many types of mortars, plasters, fillers and adhesives.